ROBERTS BROTHERS LUMBER CO. INC.
For over 70 years, Roberts Brothers Lumber Co., Inc. has sustainably harvested local hardwood and softwood logs and manufactured a wide variety of forest products for wholesale and retail distribution. As good stewards of our natural resources, nothing is wasted in the manufacturing process at Roberts Brothers. We sell byproducts of manufacturing such as firewood, sawdust, bark mulch, and wood chips. Firewood heats homes, sawdust is used for animal bedding in farms, bark mulch is sold to nurseries and landscape companies, and wood chips are used to make paper and are ground as playground material for local schools. Roberts Brothers Lumber Company's tireless commitment to providing only the very best in customer service and satisfaction has helped our Company grow and establish countless relationships with major international wholesalers of dimensional timber products throughout the United States, Canada, Asia, and beyond. The pride that our team takes in their work is apparent in all aspects of the business, from production and quality control to land management and community relations. 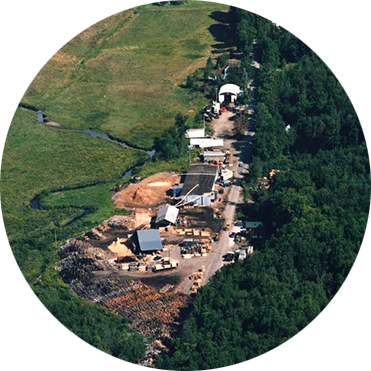 We look forward to serving your timber harvesting and forest products needs for decades to come. Choose from our wide selection of lumber products, from local pine and hemlock to some of the most sought after red and white oak found in the world. Our logs are harvested in the most respectful manner, leaving the forest in a healthier state than when we found it. Take the next step to making your landscaping beautiful with our variety of color enhanced 100% bark products. Options for playground material available as well. Looking to get a quote? Need more information? Copyright © ROBERTS BROTHERS LUMBER CO., INC. All rights reserved.